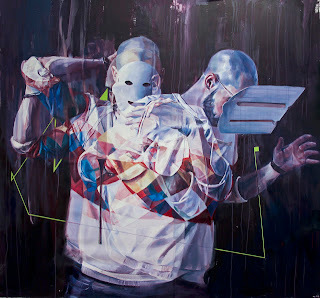 Check out these paintings from Drew Young. It seems as though they exhibit some of the same visual strategies and perceptions as Darryll's work. Rad! This is my first post on the DEFINEART blog. I am Chelsea and I work with Darryll around the studio, doing various tasks but primarily making things easier on Darryll so he can focus on his art. We get studio visits from time to time, usually just a handful of people at most to check out the work. 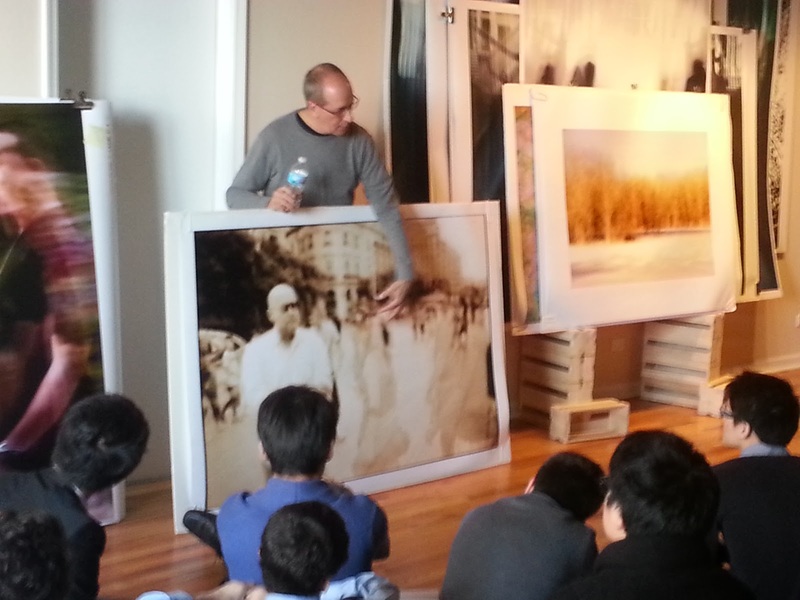 We've nailed down our "show and tell" routine but when we heard that a class of 32 boarding school students wanted to drop in for some information on Darryll and his work, we weren't exactly sure what to expect. Around 12:30pm, the students started to trickle in through the door, each dressed very professionally and carrying their own briefcase. Right off the bat I was impressed. The students were super polite, thanking us for having them, and acting more mature than most people I know at my own age. 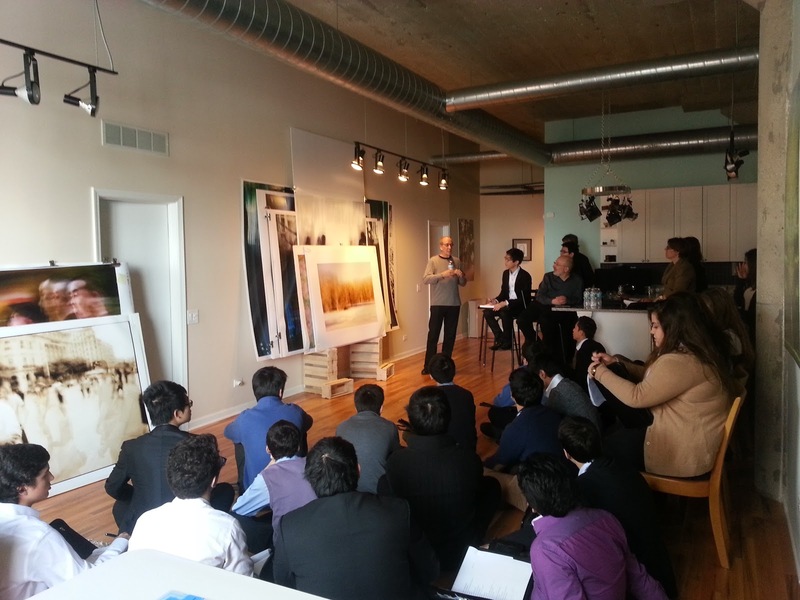 We learned that these students were visiting from the Delphian School in Oregon, on a Business Seminar trip led by their Assistant Headmaster, Mark Siegel. These students were of various ages and backgrounds, but one thing they had in common was a genuine craving for knowledge and the ways professionals of different disciplines worked on a day-to-day basis. Needless to say, it was a total pleasure having them. Darryll opened up the floor by introducing himself and his story. It seemed that the students were interested in the fact that Darryll went from commercial photography, into doing something he was more passionate about. It's so important at a young age to realize that you have options and that some decisions in life aren't always set in stone. As Darryll spoke, the students took notes and pictures, interested in the nuts and bolts of an artist living in Chicago. One student asked, "What is art? ", which is a tough question that we hope to explore through this blog. 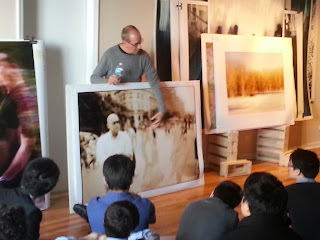 Another student, when asked what they got out of this experience, said that his viewpoint had changed about photography. Before he felt it to be very "so what?" and came to realize that it's the details that are important, especially to the artist. This is something that Darryll recognizes about his own work, that there is nothing arbitrary in the resulting images, the details all have a purpose. "You really have to do something that distinguishes yourself from the rest". While he was talking about his photography, I believe he meant for the students to take away a sense of pride in one's work, no matter what it is, and making sure that your individuality shines through it.